The major showstopper before I was seriously considering going to Git was the lack of an darcsum-like interface for Git. Yesterday night I finally decided to write it. git-status (included as git.el in the Git distribution) is usually good enough to use, but I often like to do partial commits, that is, commit only parts of a file. Git can do that now for some time, using git add --interactive or frontends like git-hunk-commit or git-wt-add. 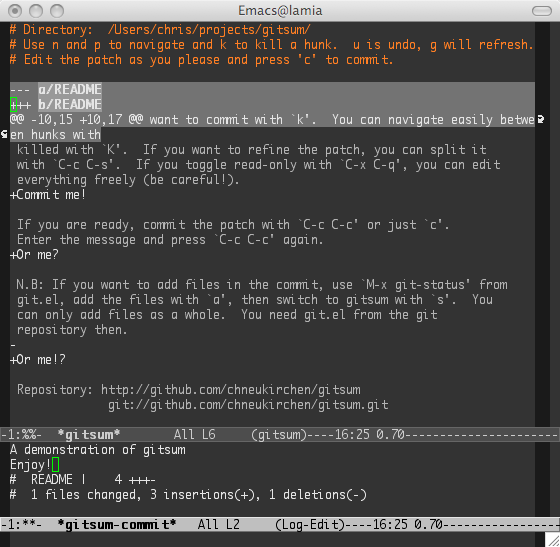 Still, there was no way to do it conveniently in Emacs. You can freely delete hunks you don’t want to commit, split big changes, or even edit the patch directly if you feel adventurous. It also integrates into git-status so you can easily switch between these frontends. Gitsum is hosted at http://github.com/chneukirchen/gitsum (which I highly recommend) and is mirrored at http://git.vuxu.org/, patches and additions are welcome! It’s still very fresh and has some rough corners, but I already notice my increase in productivity.